Tired of those conventional looking candelabras? 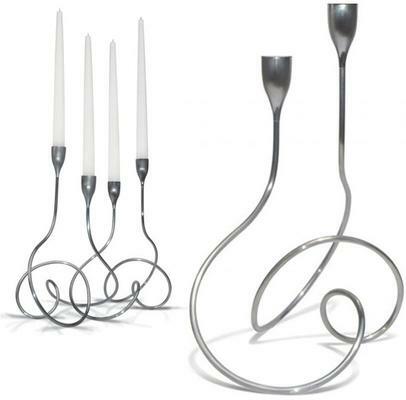 The Loop Candelabra offers a stylish new way to these classic candle holders. These are inspired from a mathematical shape, actually, the Fibonacci Curve. They loop around in perfect harmony, giving you great balance as each candle holder sticks out elegantly at the top. Use this as a centrepiece for your dining table and enjoy its gorgeous and flowing design. You can also place this on a console table or maybe add it to your mantle piece. The brush satin and chrome material really give it a wonderful glow. Black+blum designs and produces home accessories. An Anglo-Swiss team, comprised of Dan Black and Martin Blum, created the brand in 1998, and they are based in the heart of European design in London. Black+blum prides itself on creating unique, eclectic designs that are full of character. They strive to create products that will charm and entertain their clients and still offer versatility and practicality. Black+blum has a passion for design, and since each item is a joint effort from the duo, every piece showcases both their fun personalities so you can enjoy a one-of-a-kind product. Check out their range of whimsical, modern lampshades, tealight holders, and candelabras if your space needs illuminating or their contemporary, colourful dining tools if you want to add their distinctive design to your home.